I have often workspaces with projects which specify Java 1.5 as minimal execution environment. 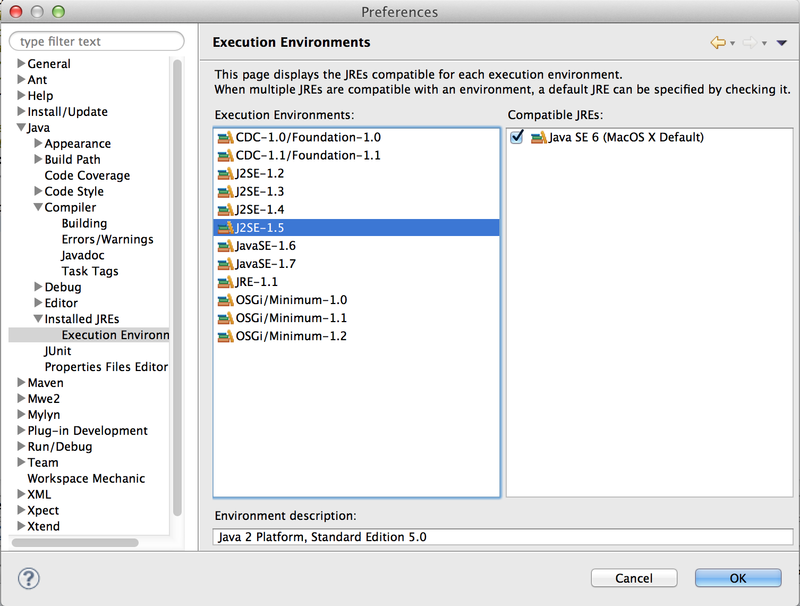 On my machine there is no JDK 1.5 installed, and it turns out that getting one for Mac OSX Mountain Lion is not trivial. Actually I don’t need a JDK 1.5, since the standard 1.6 JDK is compatible. However, this raises in the workspace these annoying warnings. Although the JDK 1.6 is marked compatible now, it is not “strictly compatible”, so the warning message remains. After changing the setting you are asked to rebuild the projects. But again, the warning do not disappear. I suspect this to be a bug and raised Bug#408317 for this. So the last chance is to filter these warnings. 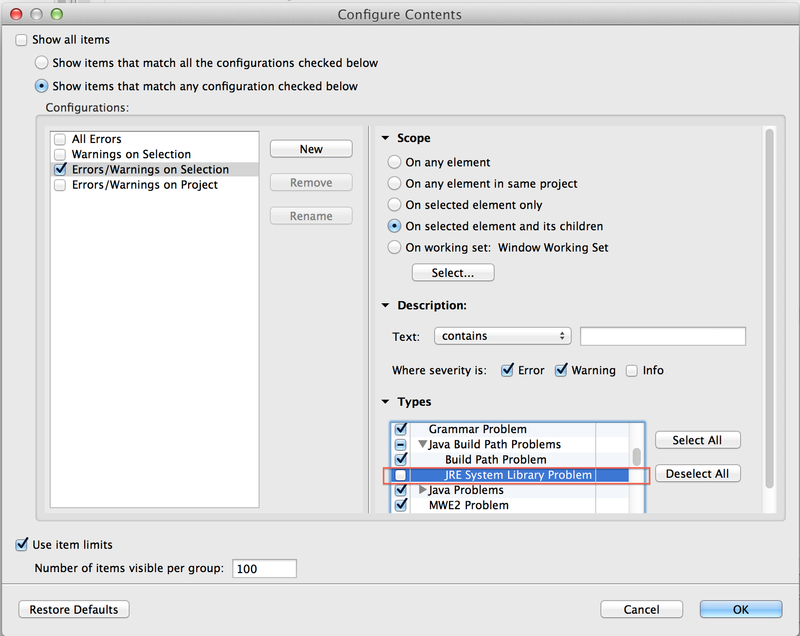 Therefore select the options menu in the Problems View and open the “Configure Contents” dialog. 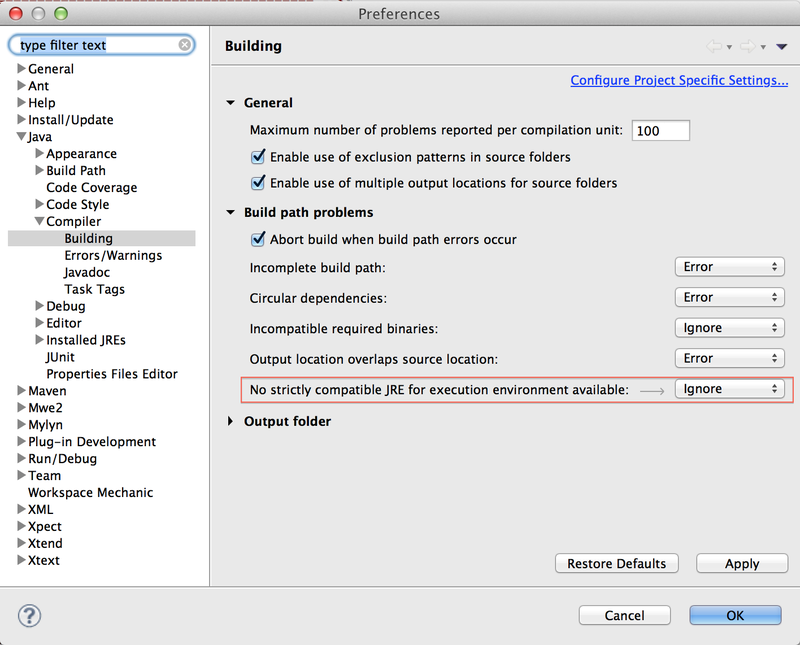 In the “Types” selection tree expand the “Java Build Path Problems” node and uncheck “JRE System Library Problem”. Finally the warning messages disappear from the Problems View. However, they are just filtered from the view, the projects themselves will still have these resource markers, so you will have a warning overlay icon on the project in the Package Explorer View although the Problems View might be empty. But this raises the next problem: Now the warning disappears and the code is compiled with Java 1.6, and thus against the 1.6 API. This leads to the problem that you could accidently use API from >= 1.6. For example, usage of String#isEmpty() would compile even if the Execution Environment is set to J2SE-1.5 (the Execution Environment anyway just defines the lowest requirement) and also if Java source compatibility is set to 1.6 in the compiler settings. I like to thank Laurent Goubet and Mikael Barbero for their valuable comments on the potential API problems.